Roola Boola Children’s Arts Festival as it returns for its ninth year this year with a program packed full of intimate performances, workshops and unique activities to ignite your child’s imagination. Running from Tuesday 3rd to Friday 13 July across Stonnington with the Festival Hub activated at Chapel Off Chapel from Tuesday 3rd to Friday 6th of July. The Roola Boola Children’s Arts Festival has a curated diverse program with some of Australia’s most renowned performers at the Festival Hub all within the accessible price point of $15 and with plenty of free events also on offer. The Festival Hub will feature Anna Lumb in Super Amazing Giant Girl, an hilarious action packed and interactive parable exploring the challenges of fitting in when you’re a Super Amazing Giant! The award winning company Asking For Trouble with FoRT, a fun and playful physical theatre show that inspires creative play with everyday objects. The timeless and much loved fairy tale Cinderella presented by Victorian State Ballet and, back by popular demand, the internationally acclaimed Trash Test Dummies with their electrifying new production Splash Test Dummies, full of laughs and plenty of surprises, this world-class troupe will display a brilliant array of catch-your-breath stunt work, acrobatics, juggling and the sidE splitting, slapstick comedy for which the dummies are famous. Candy Bowers, the 2018 winner of the Geoffrey Milne Outstanding Contribution Award will be leading a Rap Workshop designed to inspire aspiring young rappers and beatboxers. 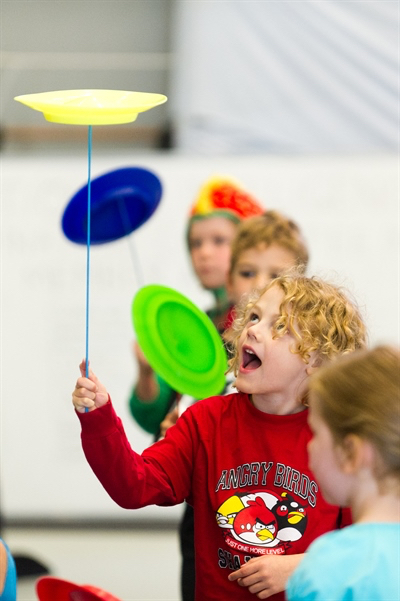 Kids can try their hand at juggling, plate spinning, hula hooping and more with The National Institute of Circus Arts, or take the Roola Boola Magic Class with master magician Lee Cohen. For the crafty ones in the family, book in the special craft activities on offer! Make and take home a Comic Book, design a Flower Crown, or get involved with the unique one on one experience of I See You Like This, where children use their parent's face as their canvas, to make a portrait with objects and materials before capturing their image on their parent's smart phone. Plus a surprise pop up performance from Cirque Du Soleil clown Cameron Taylor with Pisca. For more information or to buy tickets, head to the Roola Boola Children's Art Festival website.